Fluorescent probes exhibit the characteristics of high sensitivity, diversified design, and strong quantitative analysis ability. Therefore, they have become one of the research hotspots in analytical chemistry and biological analysis. Aptamers are single-stranded DNAs or RNAs that are obtained in vitro and can selectively bind to the targets, making them ideal candidates as identifying units in fluorescent probes. However, most of the current aptamer probes are not regulatable because their fluorescence signals can’t be changed after the fluorescent probes are bound to the target, resulting in a high signal background and limited contrast. Actually, the structure of aptamers is flexible and can be combined with a variety of nanomaterials to achieve high sensitivity fluorescence for quantitative analysis, and can be used for a variety of target determinations, such as metal ions, small molecules, proteins and cells. In addition, with the development of research on DNA nanotechnology, researchers have designed many aptamer-based fluorescent probes with special properties, which have good application prospects in complex sample analyses and even in vivo cell imaging. In this review, the development of research in the field of aptamer-based fluorescent probes is surveyed and four mechanisms of aptamer fluorescent probes, including dye intercalation, conversion of DNA conformation, signal amplification, and mediation of nanomaterials, are comprehensively discussed. Keywords: Aptamer, fluorescent dyes, fluorescent probe, nanomaterials, nucleic acid conformation, single-stranded DNAs. Keywords:Aptamer, fluorescent dyes, fluorescent probe, nanomaterials, nucleic acid conformation, single-stranded DNAs. Abstract:Fluorescent probes exhibit the characteristics of high sensitivity, diversified design, and strong quantitative analysis ability. Therefore, they have become one of the research hotspots in analytical chemistry and biological analysis. Aptamers are single-stranded DNAs or RNAs that are obtained in vitro and can selectively bind to the targets, making them ideal candidates as identifying units in fluorescent probes. 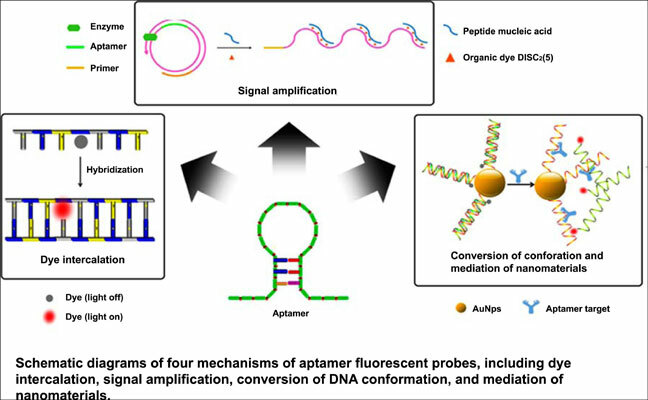 However, most of the current aptamer probes are not regulatable because their fluorescence signals can’t be changed after the fluorescent probes are bound to the target, resulting in a high signal background and limited contrast. Actually, the structure of aptamers is flexible and can be combined with a variety of nanomaterials to achieve high sensitivity fluorescence for quantitative analysis, and can be used for a variety of target determinations, such as metal ions, small molecules, proteins and cells. In addition, with the development of research on DNA nanotechnology, researchers have designed many aptamer-based fluorescent probes with special properties, which have good application prospects in complex sample analyses and even in vivo cell imaging. In this review, the development of research in the field of aptamer-based fluorescent probes is surveyed and four mechanisms of aptamer fluorescent probes, including dye intercalation, conversion of DNA conformation, signal amplification, and mediation of nanomaterials, are comprehensively discussed.